Launching in stores on 6th November, the re-usable bag is made from 75% Social Plastic, which is plastic waste that has been collected and recycled by Plastic Bank, a social enterprise seeking to stop ocean plastic pollution. Plastic Bank incentivises people in Haiti and the Philippines - two areas highly polluted with plastic - to collect waste and take it to one of 36 recycling centres in return for a wage. Collectors can alternatively exchange waste plastic for blockchain digital tokens that can be used to buy essential goods such as food, water, cook stoves and fuel. With its mission to create environmental and social impact by monetising waste, Plastic Bank prevents plastic from getting into the oceans while helping to improve people's lives. CEO of Plastic Bank, David Katz commented: "M&S has powerfully responded to customer demand for sustainable products and created an immediate impact on the lives of our collectors. "The M&S team has been incredibly committed to our partnership and thanks to their support, Plastic Bank is empowered to stop more ocean plastic, help more people out of poverty and make responsible production the standard for businesses everywhere. We couldn't be more pleased to start our journey together." 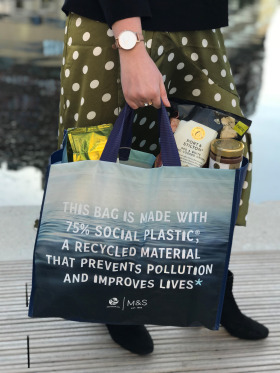 The bag has been launched as part of M&S's Plastics Plan, which includes removing 1,000 tonnes of plastic packaging in less than a year and replacing the 75 million pieces of plastic cutlery given out in its stores each year with FSC certified wood alternatives. Product developer at Marks & Spencer, Natalie Tate said: “With more plastic than fish predicted to be in the ocean by 2050, it’s vital that we all take action to minimise plastic waste. We’re reducing the amount of plastic we use as a business and developing smart ways to help our customers reduce the amount of plastic they use.